I'm going to call a spade, a spade here, CND Shellac in Untitled Bronze was my least favourite colour out of the Art Vandal collection. It's not that I don't like it but the others excited and inspired me far more. That aside I thought I'd continue on with my Focusing Posts for the collection. The mix of bronze and blush tones throws me off with the colours that are going to compliment it, I'm not even going to lie about that. That aside I put a couple of colours with it that I liked so hopefully they I'll inspire you to drag your colour pops out for a play! CND Shellac in Untitled Bronze with Lecente Iridescent Glitter in Peru over. CND Shellac in Black Pool with one layer of Untitled Bronze over (this gave an interesting shade actually) but then I decided to add a little CND Additive in Silver Ponyfoot and Lecente Stardust Glitter in Lunar randomly into the sticky layer. CND Shellac in Untitled Bronze with Lecente Stardust Glitter in Lunar over it. 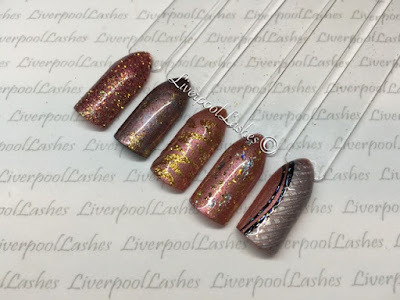 I then painted a simple design in top coat, cured and removed the remaining glitter and then applied a layer of top coat. CND Shellac in Untitled Bronze with tiny pieces of holographic gold and silver foils. 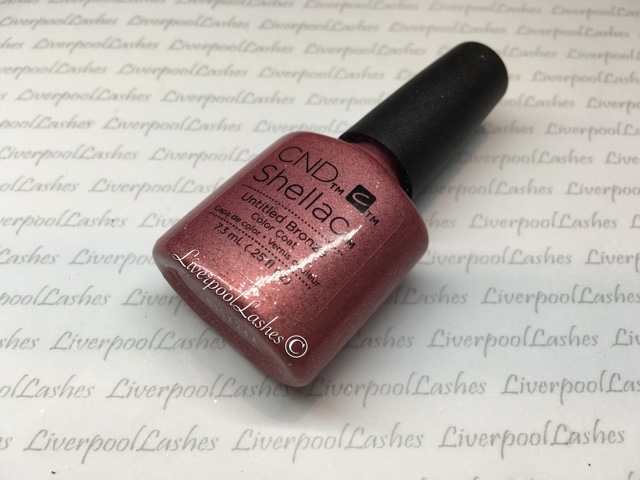 CND Shellac in Untitled Bronze with Silver Chrome. I used the Lecente S1 Nail Art brush to drag lines into the silver which I then cured adding black and curing and finishing by tapping a little silver foil into the black.